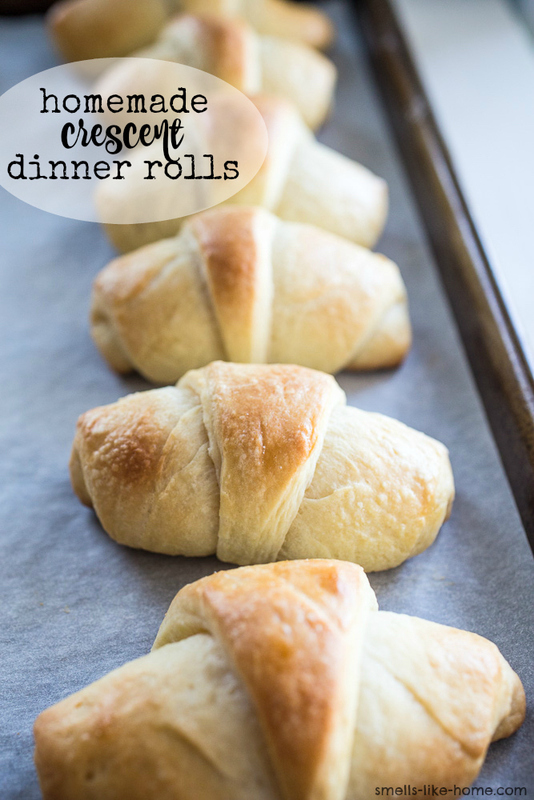 These super simple homemade crescent dinner rolls are fancy enough for a place on any holiday table but are easy enough for weeknights or weekend dinners with company. Forget the fake popped-can variety filled with ingredients you can’t pronounce and make your own crescent rolls! Holidays are never a sure bet for a great time around here. Not to be a Debbie Downer but in reality, holidays are stressful for us. Part of this has to do with the fact that our families live in different states. Mine are separated from us by a number of roads you never want to travel on a holiday/holiday weekend: the Hutchinson River Parkway, the Cross Island Parkway, and the Long Island Expressway (LIE). If you’ve braved the LIE on any Friday or Sunday afternoon between Memorial Day and Labor Day, you’ll know exactly what I’m talking about. It’s gouge-my-eyes-out-with-a-spoon brutal. The other part has to do with the problem that illness and injury tend to creep up on us on holiday weekends. I honestly don’t know how this continues to happen but I suspect two things here: 1.) we both push ourselves to the limit at work in the weeks prior to holiday time off and subsequently ignore the warning signs of depressed immune systems. Case in point: Thanksgiving 2009 landed Kyle in the hospital for 4 days with an illness with an unknown cause. And 2.) Kyle is so excited to work in the yard over a long weekend that he inevitably pulls out his back while overworking himself. This has happened on more Memorial, 4th of July, and Labor Day weekends than I can count. I can’t make this stuff up! So, what I’m getting at is that this past Thanksgiving was one of those stressful holidays. We (I) foolishly decided we should take the morning to relax at home, have a leisurely breakfast, and watch the Macy’s parade. You know, things we are never able to do on Thanksgiving. This meant that we left for my parents later than usual and what is normally a 2 hour drive took us nearly 4 hours. Like I said: brutal. On the bright side of that Thanksgiving, we had a really nice time with my parents and little bro. Dinner was over-the-top delicious with all of my favorite side dishes that continue to grace the table year after year. The one new addition this year were these homemade crescent dinner rolls. 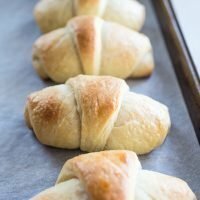 I’ve been dying to make crescent rolls over the past few years but many of the recipes I found were either too much work for dinner rolls (croissant-style butter pat method) or included shortening to aid the texture of the rolls. This recipe however, was perfect! All-butter, easy advance prep with an overnight chill, resulting in a dinner roll that doesn’t mimic the popped-can, store-bought variety. It outright blows them right out of the water! With their lightly flaky and crisp crust, pillowy and tender interior texture, and addictive buttery flavor, these homemade crescent dinner rolls deserve a place on every holiday (or any day) table. I baked off my batch before leaving the house on Thanksgiving and rewarmed them for just a few minutes on a baking sheet in a 250° F oven while I helped dad carve the turkey. You would never know they were reheated rolls! 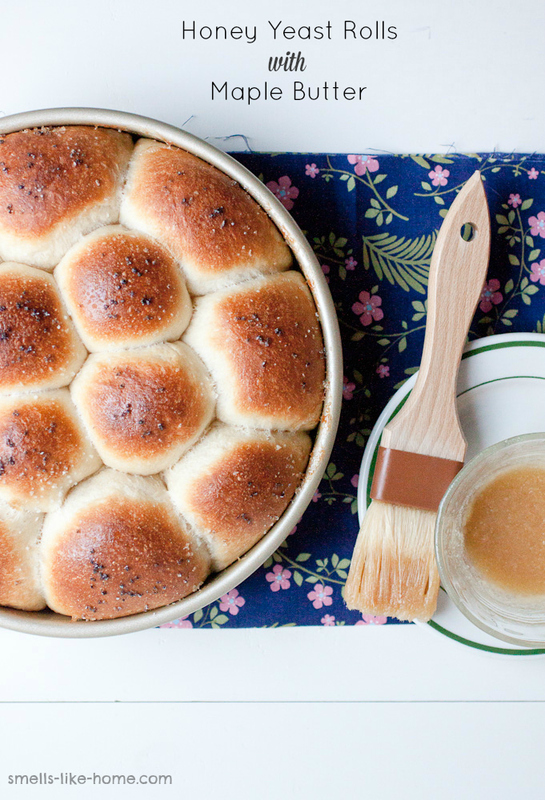 The rolls retained all of their tenderness and did not dry out at all. Success! Piled up high in a napkin-lined basket, these homemade crescent dinner rolls were the highlight of the meal for me. They almost made me forget about my earlier vow to never travel on Thanksgiving ever again. And if you’re wondering, you’ll find the two of us brunching at a local hotel this Easter followed by a visit from one of my cousins – a low key, simple, and delicious day. My favorite kind of holiday. Homemade crescent dinner rolls are a fun baking project for a holiday dinner or a simple weekend meal. And they're WAY more delicious than the store-bought popped-can variety! 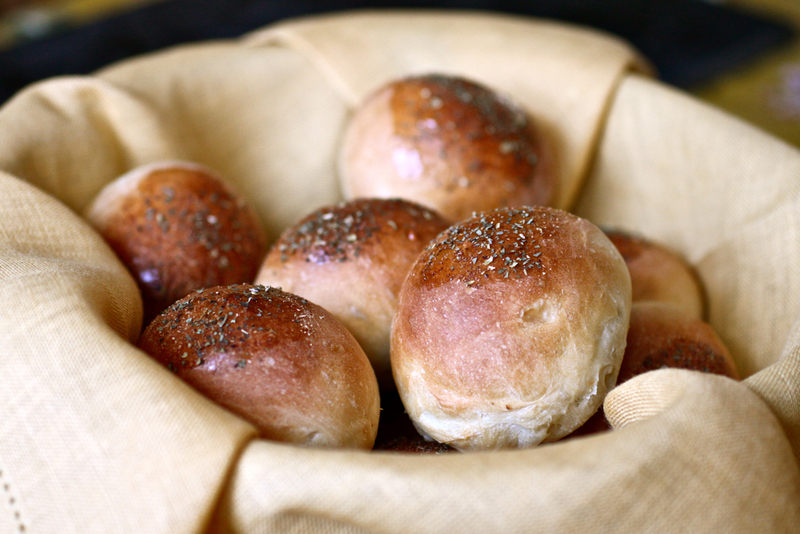 You can bake these rolls in advance of dinner and reheat on a baking sheet at 250° F for 8 to 10 minutes. Preheat oven to 200° F and then shut the oven off. Line a large baking sheet with parchment paper and lightly grease a large bowl; set both aside. While the oven heats up, in a large measuring cup, whisk the melted butter, half-and-half, yeast, and 1 teaspoon of sugar together until the yeast dissolves. Whisk in the whole egg and egg yolk - save the egg white for a later step; set mixture aside. Stir the flour, remaining sugar, and 1 teaspoon of salt together in the bowl of a stand mixer fitted with the dough hook. With the mixer on low, power the liquid mixture into the bowl in a slow, steady stream and mix until the dough starts to come together, about 1 minute. Increase the mixer speed to medium-low (setting 2 or 3) and knead the dough for 5 to 6 minutes, until the dough pulls away from the side of the bowl. Transfer the dough to a clean work surface and knead it for a few seconds to pull it into a ball. Roll the dough ball around in the greased bowl until coated with oil. Cover the bowl tightly with plastic wrap and set it in the warm oven for about 1 hour or until it doubles in size. 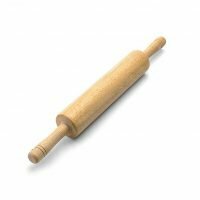 Transfer the dough to a lightly-floured surface and roll it into a 12-inch circle. Spread the remaining butter over the top and then sprinkle the remaining salt evenly over the butter. Cut the dough into 12 equal pie-shaped pieces (a pizza cutter makes really quick work of this). Starting with the wide end of one of the pieces, roll the dough towards the pointy end. 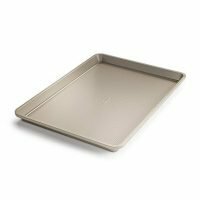 Place the roll on the prepared baking sheet with the pointy end tucked underneath; repeat with remaining dough. Cover the rolls lightly with a large piece of lightly-greased plastic wrap and allow them to proof in the still-warm oven until they double in size, about one hour. 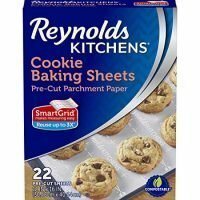 At this point, you can refrigerate the rolls overnight on the baking sheet, covered with the plastic wrap. With the rolls out of the oven, preheat the oven to 350° F with a rack centered in the oven. Whisk the remaining egg white with the teaspoon of water until slightly frothy. Brush all of the rolls once and then a second time with the egg white mixture. Bake for about 20 minutes, rotating the pan after 10 minutes, until they are golden brown and gorgeous. Cool on the baking sheet for 10 minutes before serving. Storage: Rolls will keep well at room temperature in a zip-top bag for about 2 days. 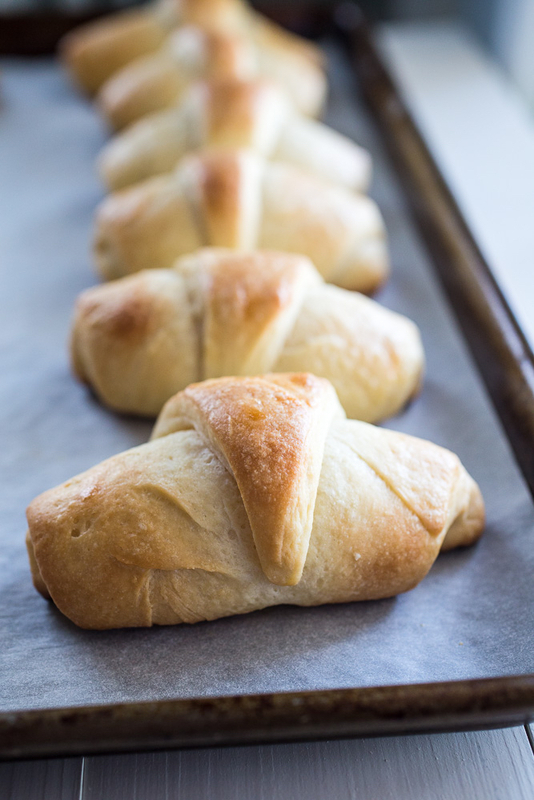 I have been dying to make homemade crescent rolls for everrrr-love this recipe!